As a magazine editor and writer for the past 25 years, I’ve learned the utility of pursuing a story with persistence that rivals a pit bull, but the bone I dig up isn’t always the one I’m after. That is just what happened when I stumbled upon the Drake Strike 33 sniper rifle. Through my research, I learned that Remington Defense had worked in cooperation with Cadex Defence to create a rifle chassis system and build the first XM2010 prototypes. Somewhere along the way, Remington decided to part company with Cadex and produce the chassis system in-house. I figured that Cadex might have a leftover prototype of the XM2010 lying around. I was wrong, but I did learn that Cadex improved their initial designs of the XM2010 chassis system to a third-generation model. 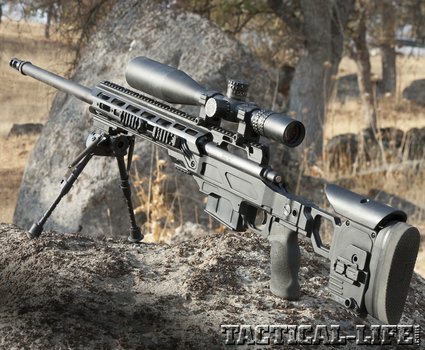 Cadex then collaborated with Drake Associates in Long Island, New York, to offer a series of bolt-action sniper systems. 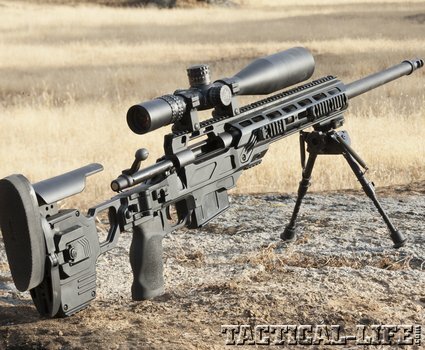 The Drake Strike 33 is essentially a commercially available upgraded version of the XM2010, which is proving highly popular with law enforcement agencies seeking a highly accurate long-range sniper system. To get a fix on the Strike Dual, it’s beneficial to take a look at the history of Remington’s XM2010. 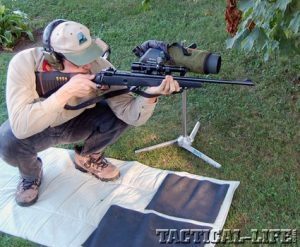 The U.S. Army issued a solicitation in May 2009 for reconfiguring the M24 Sniper Weapon System (SWS) currently in the Army’s inventory. It was determined that the 7.62 NATO cartridge that the M24 was chambered for couldn’t reach far enough for the sniping roles encountered in Iraq and Afghanistan. To build what would become the M24E1, the M24SWS would be rebarreled and re­chambered to accurately fire the Mk 248 Mod 1 .300 Winchester round. The Mk 248 is the match-grade .300 Winchester Magnum that was developed with a 220-grain Sierra Match King bullet fired at 2,850 fps.This ammo was initially developed for the U.S. Navy’s Mk. 13 MOD 5 and was specified to increase the maximum effective range oWf .300 Winchester Magnum sniper rifle systems to 1,500 yards, decrease wind drift, reduce muzzle flash and remain temperature stable from -25 to 165 degrees Fahrenheit. The next upgraded modification to the M24 was to replace the existing Weaver rails with a MIL-STD-1913 (Picatinny) rail capable of accommodating both a day optic and in-line forward-mounted AN/PVS-26 night vision device. The M24 refit required a new stock that incorporated a detachable box magazine, adjustable comb and length of pull. The barrel was required to accept a detachable sound suppressor as well as any necessary barrel modifications required for sound suppressor interface. The existing day scope and rings were to be replaced with a specified variable-power day optic and compatible rings. Remington had a leg up on the competition, since they had been the original builders of the M24S WS. In September 2010, the United States Army’s Joint Munitions and Lethality Con­­­­­tracting Center awarded Rem­­­ington a Firm Fixed Price Indefinite Delivery/Indefinite Quantity contract for the upgrade of up to 3,600 M24 Sniper Weapon Systems currently fielded to the Army pending type classification as the M24E1 Enhanced Sniper Rifle (ESR). 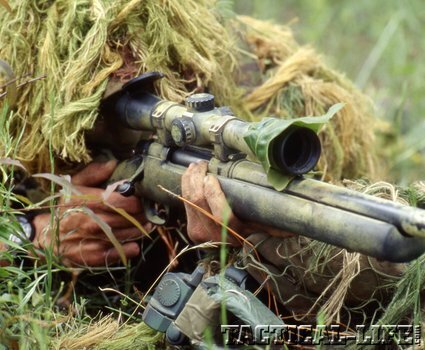 Later the Enhanced Sniper Rifle was classified as the XM2010. As previously stated, the M24E1/XM2010 is a “total conversion upgrade,” by which the barrel, stock, magazines, muzzle brake, suppressor, and even the optics are changed. Besides the rechambering and rebarreling with a 24-inch 1:10 twist rate 5R hammer-forged barrel, a new chassis (stock) assembly, which maximizes the amount of physical adjustments for the sniper to provide a better user customized fit, is part of the package. The chassis has a folding buttstock that shortens the system for easier transport and better concealment during movement and accommodates the mounting of accessories via removable Picatinny rails. A five-round detachable box magazine feeds the XM2010. A quick-detachable Advanced Armament Corp. sound suppressor with muzzle brake comes with the system. A Leupold Mark 4 6.5-20x50mm ER/T M5 Front Focal variable scope put the rifle on target. Advanced corrosion-resistant coatings throughout the system make it resistant to exposure to the elements. The accuracy requirement is sub-MOA. Integrating a barreled action, with versions available for .308, .338, .300 Win Mag or .50 BMG actions, Drake Associates offers Cadex Strike Dual chassis to provide integrated sniper systems. These systems retain the right-side folding stock, but offer two handguard tube lengths. Also retained in long tube mode is an integrated optic rail for inline mounting of night vision devices, along with accessory side rails for lasers. An adjustment for cheekweld and length of pull remain, but the chassis’ adjustments are paddle-type and pinch levers, whereas the XM2010 uses rotating knurled knobs. Both rifles employ AR-type pistol grips. Users can employ the forward rail for mounting a bipod, and rear rail for mounting a monopod. The Drake Associates’ Cadex Gen 4 chassis integrates a removable magazine well and triggerguard. I was able to remove these components in less than two minutes to lower the pull weight on an XMark Pro trigger. Flush cup sling mounts are fitted at the buttstock hinge and forward of the magazine well. Another difference between the XM2010 and the Strike Dual chassis is that the XM2010 incorporates milled channels for accessory wire management and the Cadex chassis does not. Currently, the Cadex Strike Dual rifle chassis system is available to fit 11 different actions. 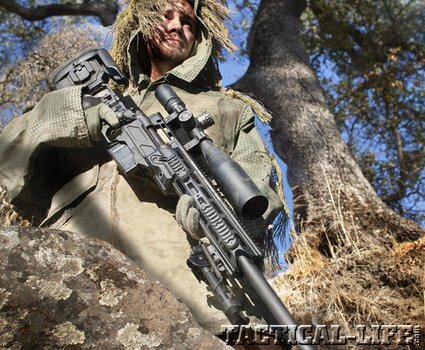 The first action is the RangeMaster 7.62 for .308, as well as the Remington 700 short action. Fans of .338 Lapua Magnum can select between versions to fit the McMillan TAC-338, PGWDTI Timberwolf, or Remington 700 long action. The same chassis system also fits the Remington 700 long action chambered for .300 Winchester Magnum. This is the version used to build the Drake Strike Dual rifle tested in this article. The Strike Dual rifle chassis is a solution that provides the user modularity and portability for their precision rifle system. Various top rail MOA inclinations are also available. Once folded, the stock presents a lever that unlocks the buttstock for deployment. A feature of the folded stock is that it captures the bolt handle to keep it securely in place in rough conditions. The buttpad is adjustable for height, as is the cheekpiece. The length of pull also adjusts to add more than 1.5 inches of adjustment. All adjustments are possible through the use of paddle levers alleviating the need for tools. The Strike Dual’s 24-inch barrel in .300 Win Mag wears a modern Cadex stock system. 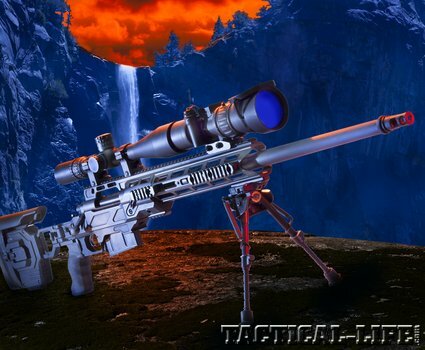 Topped with a Nightforce NXS 5.5-22X, this is a top-flight sniper system. Built from 6061-T6 aluminum, the Strike Dual chassis system that is used to build the the Drake rifle in .300 Win Mag weighs 7.5 pounds. Add the barreled action and a magazine and the weight rises to 12.1 pounds. With the stock deployed, it measures 2.35 inches wide, 7.37 inches tall and 34.93 inches long. Folded, it is 4.7 inches wide and 25.28 inches long. The overall length of the Strike Dual is 47.25 inches at the shortest length of pull. 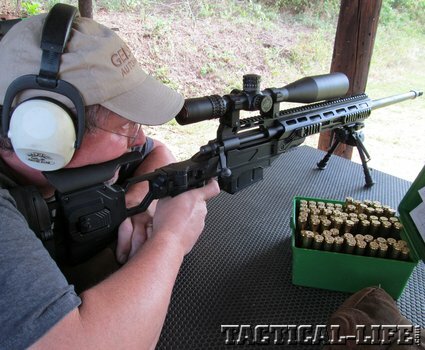 As with the XM2010, the Drake Strike Dual uses a Remington 700 long action. A 24-inch barrel with 1:10 twist 5R rifling is tipped with an AAC 51-tooth combination muzzle brake and suppressor attachment. To match the precision offered by the Drake Strike Dual, a Nightforce NXS 5.5-22x50mm ZeroStop Mil-Dot scope was mounted in a set of high rings. Ammunition comparisons were conducted at 100 yards during two shooting sessions from sturdy benches. Either a Bulls Bag rest or the system’s bipod was deployed, and a rear squeeze bag used to make hold adjustments. Weather conditions for close-range work were mild. Temperatures were in the mid 70s, and wind was 7 to 10 miles per hour from 6 o’clock. When shooting to 500 yards, the temperatures were the same but the wind was blowing from 3 o’clock. Federal’s Gold Medal Match loads tipped with 190-grain Sierra Match King bullets produced the best average for five-shot groups at 0.752 inches. Discounting one flyer, the average for all groups would have been 0.589 inch. The smallest five-shot group measured 0.592 inches. Average velocity was measured 15 feet from the muzzle with a chronograph at 2,892 fps, as were all loads. Hornady’s 180-grain SST Superformance load didn’t fare quite so well. The average for all groups was 1.635 inches, but posted a blazing 3,134 fps average velocity. The smallest group measured 1.5 inches. Remington’s Premier Copper Solid 165-grain loads averaged 1.224 inches. The smallest group measured 1.152 inches, and the average velocity was 3,252 fps. Mark 248 Mod 1 loads are the U.S. military’s standard 220-grain open-tip match sniper rounds for rifles chambered in .300 Winchester Magnum. The smallest 5-shot group went 0.662 inches. Another group measured 0.765 inches, with the average for four groups going 0.790. Velocities averaged 2,756 fps. I wasn’t disappointed with the results of handloading for Strike Dual. I selected 174-grain Hornady Match bullets, and used once-fired Hornady cases filled with 71.0 grains of IMR 4831. Federal 215 Large Rifle Magnum primers provided ignition for all my handloads for this rifle. The first group fired measured 0.337 inches, which was the smallest of all groups. The average for four groups was 0.671 inches. Velocities averaged 2,794 fps. The Hornady brass was full-length resized with a Hornady die. I used once-fired Federal brass to load up 220-grain Sierra Match Kings atop 68.4 grains of IMR 4831SC. The tightest group measured 0.541 inches of four groups fired, which in aggregate averaged 0.784 inches. To switch things up, I backed the Hornady sizer die off to only re-size case necks. Using the Remington cases left from firing the factory rounds, I loaded a 210-grain Berger Hunting VLD bullet ahead of a charge of 66.0 grains of IMR 4831. The Remington cases were full-length sized using a Hornady die. This load posted groups measuring 0.754 and 0.800 inches, which were the smallest of four groups fired. A 10-shot string averaged 2,710 fps. When I moved to my long range, I wasn’t able set up a precision shooting position, since the farmer had yet to cut the cornfield. I set up a Tubb Tactical Stake Target at the 500-yard position, and drove back around the field to make an improvised firing position. Sitting atop the bed of my truck, I placed a Midway USA shooting mat across the roof of my truck to keep from peeling the paint off the roof. After dialing in the crosswind, I was able to hit the 7-inch wide by 12-inch tall target more than 75 percent of the time. My hits would have been higher except for the slight breeze buffeting my truck as I squeezed off a shot. If you are in the market for a near facsimile of the U.S. Army’s M24E1, and want to get your hands on one even before the military fields their first one, use the following: drakeassociates.us, 631-749-1100; cadexdefence.com, 450-348-6774.